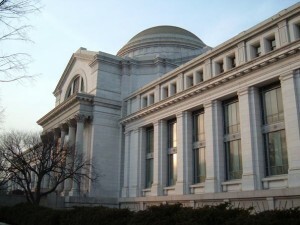 The Smithsonian Institution at one time distributed, upon request, a lengthy Statement Regarding the Book of Mormon in which the Institution listed several specific points of contention between science and Book of Mormon claims (among them the physical type of the American Indian; the Book of Mormon’s anachronistic assertions of New World pre-Colombian use of Old World metals, domesticated food plants, animals, and other items; the absence of any confirmed relationship between the archeological remains in Mexico and remains in Egypt; the absence of ancient Egyptian, Hebrew, and other Old World writings in the New World). In March 1998 the Smithsonian radically revised its public statement. In early 1999 I wrote to the Smithsonian to inquire about the new statement and their reasons for the changes. Following is the text of my letter to the Smithsonian Institution; following that is the text of the letter I received in response. It has come to my attention that the Smithsonian Institution has issued a new “Statement Regarding the Book of Mormon.” I would appreciate it very much if you would provide me a copy of this Statement using the enclosed pre-addressed, pre-stamped envelope. I would also like to know what has precipitated the necessity of a new Statement. Is there anything in the Smithsonian Institution’s previous “Statement Regarding the Book of Mormon” (the copy I have is designated SIL-76 1988) which has been proven inaccurate by subsequent research? If so, would you please instruct me on what those inaccuracies may be? Thank you very much for your help and kind attention to my inquiry. Thank you for your letter. We still stand by our former statement on the Book of Mormon. It was a decision of the Smithsonian’s central Office of Public Affairs to simplify the statement to respond to general questions regarding the Smithsonian’s use of the Book of Mormon. Below is the statement we presently distribute for these general inquiries. Your recent inquiry concerning the Smithsonian Institution’s alleged use of the Book of Mormon as a scientific guide has been received in the Smithsonian’s Department of Anthropology. The Book of Mormon is a religious document and not a scientific guide. The Smithsonian Institution has never used it in archeological research and any information that you may have received to the contrary is incorrect. As much as Mormons would like to believe that the Smithsonian Institution “backed off” its previous findings and Statement Regarding the Book of Mormon, that just isn’t the case. The changes to the Smithsonian’s statement did not seek to “bring it up-to-date scientifically,” for the Institution continued to “stand by” its former statement–a statement that detailed many scientific problems with the Book of Mormon. Mr. Starling’s recent assertion that the Smithsonian Institution has “a more prudent current statement that admits what they just don’t know” is widely off the mark. This entry was posted in Book of Mormon and tagged Book of Mormon, Smithsonian. Bookmark the permalink. I have said this before and will say it again. Why is it we find in the Bible, Jesus and the apostles quoting the OT, Going in spots all the way back to the garden, and we see a few spots in the book of acts where the apostles give a run down of the OT and what took place, yet we never hear them mention any book of mormon prophets, or cities or anything? Why, why why????? I ask because according to the BoM, it gives and account of the Tower of Babel that contradicts what is given in the Bible. So it stands to reason if people in the BoM date back to the tower of Babel then they should be mentioned by people that lived in the same place and time. The difference here is that Joseph Smith placed horses, metals, food, elephants, and many other things that were familiar to him in the 1800’s, into the Book of Mormon. These things didn’t exist in the Americas at the time he says the Book of Mormon took place. These things can and have been studied by Archeologists and Anthropologists. Even Mormon Archeologists can’t dispute this. Doesn’t it bother you that Joseph Smith clearly taught that the Lamanites lived in and around New York near the hill comorah? Today’s LDS Apologists are putting out there more than one hill comorah. Maybe it’s in Meso America, oh wait, maybe it’s in Asia. DNA doesn’t fit no matter how much Mormons want it to. Look at the places in the Bible. I can still go to Israel. Bethlehem, Jerusalem, etc. Tell me, can you go to Zarahemla? No one outside of Mormonism had even heard of the places in the Book. There is no way that millions of people lived and died and there is not ONE trace of them anywhere. What about the last battle? Supposedly 2 million died. Where are the swords? Dead horses? Oh wait, LDS apologists are now saying that it wasn’t really horses but tapirs. Have you ever seen a tapir? How does a full grown man put on all that metal armor, grab his heavy, steel sword, mount his tapir and head into battle??? Seriously, I’m LOL right now! It’s all so ridiculous! Great article. I have seen a pattern of dishonesty by the LDS that is staggering. It seems that no matter what the topic or issue is, there are plenty of lies to go around. I have also noticed that the lies can be very subtle, but they are still lies. The Book of Mormon , the word of God ? I personally settled this issue years ago. church leaders have contributed to this confusion ! [ see MRM newsletter Feb.2010 ]. it’s precepts than any other book , that it clarifies the Bible concerning doctrine etc. Your point is………………..therefore the BoM is true? I like you. Just keeping it real. I have more faith in and respect for you to see you haul out the old Mormon tactic of trying to find something in Christianity or the Bible and try to basically say, “See……………blah, blah, blah”. You get my point. You must have some sort of progressive take on the BoM. The Community of Christ Mormon sect gives their members the option to see the BoM as a “spiritual” book. I think they’ve got it figured out. Bottom line I guess is that it’s the best book Smith could produce seeing he had to use a magic rock to do it! As you know, Many of us here on this blog, myself included have been to Israel and have seen these places and walked among the people mentioned in the Bible. How many mormons can say they have been to places mentioned in the BoM? And before any LDS member says again, well the History is only a few hundred years, thats why none of these places are around, I say again, Bull! Again, if the People in the BoM mention prophets and quote from the Bible, then thats means they somehow interacted and knew one another, or had some contacts to be able to talk, yet no one in the Bible mentions prophets or places from the BoM. Then again, if the tower of Babel is mentioned in the BoM and that version contradicts the Bible, then thats says something does not pass the smell test. I think the part of this article that is interesting is how the Mormons continually weasel around trying to make something say what it doesn’t say. Every time I observe Mormons playing this flim flam game, I’m reminded that this is the real issue in Mormonism. That is, Mormonism is based on lies and deceit and it is maintained on lies and deceit. It really doesn’t matter what the subject is, Mormons cannot be straight forward and honest. What Mormons do isn’t just a matter of opinion or a different way of looking at things. Joseph Smith was not in any way credible. The tales he spun were total fantasy and worse. Mormons base their “knowing” that the BoM is true, on a feeling they get when reading the book. A person could read any number of books and the same feeling would be generated. Such a person is grounded in reality and knows the book, producing the feeling is fantasy. Mormons suspend credulity and common sense in order to “know” the BoM is an actual history and factually accurate. The book “Ben Hur” can stir the same feelings. Setting aside my ideas, rationales, proofs and lame excuses for the issues you brought up, the real question message I got from Sharon’s post was how important is that every drop of the BoM be corroborated by secular scholars? And thats a though question for me because back before I had to drop out and get a real job I was going to school to be a historian. It reminds me of a question I heard once. If there was no historical proof of the Bible (and to be honest there isn’t historical evidence for most of the major events) would I still believe in it’s saving power and truth? My answer to that question is yes I would because I have a witness of it’s truth. It’s the same for me with the BoM. I wasn’t trying to pull a “christians have problems too” though I’m not above doing that when I think it’s relevant. It was my tongue In cheek way of saying I take what they say with a grain of salt since I imagine they would be equally critical of a majority of the Bible. You did give me something to think about though. I’ve normally had a fairly literal view of the BoM, but not of the Bible. In fact since I don’t belive that the Tower of Babel story actually happened (at least not exactly how it was written) how can I go on to believe the Book of Ether? Food for thought. How can you believe the BoM if you dont believe in the tower of Babel story? It’s mentioned in the BoM, so you dont believe the Bible and the story of the tower of Babel, then you also should not believe in the BoM. It would be nice if just ONE thing in the BoM could be corroborated by secular scholars. The problem most Mormons miss is if Joseph Smith made up the BoM, he has led millions from the true and living Christ. This is the real issue for me. The only parts of the BoM that are true are the parts that Joseph Smith plagiarized from the Bible. That’s it. Again I have to ask which version of the BoM is the true and correct one? 1830 version or the current one you use. Like it or not, there have been doctrinal changes to the BoM. Really what I got out of Sharon’s post is that once again, Mormons are publicly being dishonest. The Smithsonian hasn’t changed it’s view of the BoM and Mormon Robert Starling is lying and saying they did. Which I’m sure the claim by the church would be that Mr. Starling isn’t “official” but ask yourself, how many Mormons and Non Mormons alike will believe that what he is saying is true? At some point people need to use common sense. I see you’re getting a lot of attention here. Sandra and Gerald Tanner, founders of Utah Lighthouse Ministry, were Mormons who began to have some doubts about Mormonism. The more they dug into church documents the more they came to believe that the LDS church wasn’t as it promotes itself. The funny thing is that after losing faith in the Mormon system and leaders, they still clung to the BoM. It took some time but eventually that “pillar” fell also. I believe that Gerald and Sandra would even carry the BoM to the Christian church they were attending. What is it about the BoM that has an attraction for some people? Grant Palmer, author of “An Insider’s View of Mormon Origins” had an interesting take on this. He explained on Mormon Stories with John Dehlin that he thinks that people respond to the revivalist message contained in the BoM. He said that if you study the eight preachers in the BoM they are perfect characterizations of the Methodist circuit rider preachers who were active in the revivals of Joseph Smith’s era. Palmer went on to explain that he thinks that the BoM is about 25% KJV of the Bible, 25% Christian revivalism, 25% from other literary works and 25% of things that were “in the air” i.e. the “environment” of Smith’s time. Foremost among the latter was the idea that the American Indians were descendants of a lost tribe of Jews. I’m doing this from memory but I think these were the sources for the BoM that Palmer mentioned. The fascinating thing is that Joseph Smith went off the tracks after he wrote the BoM. Specifically, he went from a traditional view of the nature of God to a bizarre notion of men becoming gods. I’m sure you are aware of the sects of Mormonism that reject the Nauvoo style Mormonism that Joseph Smith promoted when he hit his creative stride. I think you might find these statements by the Community of Christ interesting. Its apparent that there are different sects/denominations of Mormonism each having its own particular take on the BoM and all things Mormon. You’re an interesting fellow, open minded and willing to think out of the Mormon box. It will be interesting to see if this tendency proves difficult for you within the Salt Lake City Mormon denomination. I’m sure one day Mormons will say that the Smithsonian statements about the book of Mormon are just folklore. TJay, statements like yours are incredibly naive. NOTHING supports ANYTHING in the Book of Mormon. While some events in the Bible can’t be corroborated, we can at the VERY least prove it’s an ancient document dealing with real civilizations. The BOM can’t even be proven to be ancient. NO evidence shows that it existed prior to Joseph Smith. In fact, the anachronisms point to the opposite–that the BOM was made up. The LDS lie so much it makes me sick. How can you believe the BoM if you don’t believe in the tower of Babel story? Umm… That’s the question I just asked myself? Honestly I don’t have an answer and it’s something I will have to think about. I’ve pretty much always considered that story to be allegorical in nature and not an actual historical event, but I’m not sure that fits with the BoM narrative. Like I said, food for thought. Really what I got out of Sharon’s post is that once again, Mormons are publicly being dishonest. I’ll agree with you that Mr. Starling’s comment that the Smithsonian “admits what they just don’t know” is off to say the least. Glad I’m not an apologist. Thank you? Honestly I don’t think I get any more attention here then Clyde or Fred when I post. It hasn’t been so far, and I haven’t received any pushback from people that I have talked to about my odd beliefs. Maybe I’m not as far out of line as I sometimes think. I see you choose to ignore some of the latest findings. I asked my friend Andy Watson to post regarding the Tower of Babel. I don’t think we want to take off on another journey in a different direction, however I think it would be helpful. Andy, in addition to a full time job, is finishing up a degree in Biblical studies. He just completed a course in the Book of Genesis. We can pick just about any topic relative to Mormonism and see a consistent pattern of lies and deceit. It’s apart of the culture of the Mormon religion. What’s amazing is the level of comfort, both the Mormon leadership and the rank and file members, have with the dishonesty. In the case of the rank and file, they’ve swallowed and believe the pathetic explanations that the leadership presents. With Mitt Romney seeming to be a sure bet for the Republican nomination for president, the Mormon religion will undergo increased scrutiny. I imagine there are Mormons who think that God has his hand on Romney and that this is going to be a positive thing for spreading the Mormon restored gospel. However I don’t think so. It’s a lot easier for Mormonism to fly a little under the radar screen projecting a Norman Rockwell image. Mormonism has a couple of ways to go. They can get out in front with the true story or they can double down with the lies. In the case of the Smithsonian Institute, this is a clear case of lying. In a way this is really sad, yet rather typical of today’s Mormons. I notice in the article Mr. Starling is busted for being dishonest and where are the LDS like Clyde and Fred? I notice when someone is busted for being dishonest the Mormons find a way to disappear and have no reply. I am a chef and I gotta say, one thing I hate is Liver. I like you though, we might not agree and I wonder how you can believe in Mormonism despite all the problem, but at least your honest in saying, I dont know. IF all I had was Sharon’s small number of facts and used that to agree with her conclusion, I would believe like you do. But since there is more information out there, I find her conclusions, and your beliefs, to be wanting. What “latest findings” are you talking about???? I think you need to re-read the article. I’m glad that TJayT can talk about his “odd beliefs” to other LDS. That didn’t happen for me. I bet it doesn’t happen for too many. I would caution TJayT not to get too comfy spreading and teaching his beliefs, it may land him in “a court of love” or at the very least, the bishop’s office. Thou shalt not lie is one of the 10 commandments the Mormons claim to live by. I haven’t seen so much dishonesty in all my life. From the leaders on down the line. One of the questions asked in the temple interview is ” Are you honest in your dealings with your fellow man?” How are these Mormons truthfully going to the temple? Tjay is correct in noting that secular historians reject the Tower of Babel account and everything occurring before this event took place (Garden of Eden, the Flood, etc.). These secular historians reject all of this namely because they deny the authorship of Genesis being attributed to Moses. The JEDP Documentary Hypothesis theory put forth by Wellhausen during the Enlightenment became the accepted positions among those in academia and is still the prominent position of secular scholars. In short, this theory rejects Moses as being the author of the Pentateuch; the Pentateuch was put together over hundreds of years by numerous authors; the Pentateuch is seen as a later writing of the Hebrews rather than an older writing. The Jews and early Christians clearly viewed Moses as the author of the Pentateuch. The Talmud refers to the first five books of the Bible as “the Books of Moses.” The Mishnah and the Jewish historian Josephus both accepted the Mosaic authorship of the Pentateuch. There are many references within the Pentateuch that claim Moses as the author (Ex 17:14; 24:4, 7; 34:27; Numbers 33:2; Deut 31:9, 24). The LORD spoke directly to Moses on numerous occasions (Lev 4:1). The New Testament references Moses as being the author of the Pentateuch (Luke 24:27, 44). Even Jesus said that Moses wrote the Law (Pentateuch)! All scripture is breathed-0ut by God (2 Tim 3:16). This includes the account in Genesis. What does this have to do with the Tower of Babel? Everything, because it’s all linked as historical narrative. Genesis chapter 10 is called the “Table of Nations,” which were the nations of the known world were brought about by the three sons of Noah from the Flood narrative in the prior chapters of Genesis: Japheth (Gen 10:2); Ham (Gen 10:6); Shem (Gen 10:21). Genesis chapters 10 & 11 are reversed chronologically. The point of contact between the two chapters is the birth of Peleg (Gen 10:25) where “the earth was divided”. At that point the Tower of Babel account in Gen 11:1-9 may have happened causing the people to spread out into the earth until they settled in their tribes as described in Gen 10. Chapter 11 is the cause; chapter 10 is the effect. The broad survey is given first, and then the narrowing and explanation follows. Genesis 10 gives an incredible amount of historical data with genealogy and geographic locations. To say that this would be allegorical in nature is silly. I find it extremely important that the genealogy of Jesus is traced back to His lineage coming from Peleg and Shem (Luke 3:35-36). Keep this in mind when thinking about the validity of the Tower of Babel account. The Noahic covenant is recorded in Gen 9. This was an unconditional and everlasting covenant that is still in effect today. However, there were conditions that accompanied this covenant. One of these stipulations was that God commanded Noah and his progeny to “be fruitful and multiply; populate the earth abundantly and multiply in it” (Gen 9:7). The careful reader notices in Gen 11:1-9 that this stipulation has been disobeyed by the people of the earth because they had congregated mostly into one area. This area was Mesopotamia (the Fertile Crescent). Genesis 11:2 references “the land of Shinar”. Was this a real place? Yes; this is referenced in Gen 10:10; Isa 11:11; and Dan 1:2. The tower in Gen 11:4 was a ziggurat. The ancient Mesopotamians built these to replicate their idea that their gods lived in mountains. Ziggurats were substitutes. These were stepped towers of three to seven stages. Genesis 11:4 records the people as saying, “…let us make for ourselves a name, otherwise we will be scattered abroad over the face of the whole earth.” As was stated earlier, this was in violation of the Noahic covenant. Their wanting to make a name for themselves characterizes pride and disobedience, which God opposes any enterprise that is characterized on these foundations. The Lord’s coming down (Gen 11:5) implies prior knowledge of what was taking place. God brought about covenant judgment on the people for their violation of that covenant by scattering them and confusing their language to prevent any further violations of this covenant (Gen 11:8-9). This area eventually did become a city called Babel, which means confusion. Babylon was the prototype of all empires that raise themselves in pride. Was Babel a real place that was developed after this event in Gen 11:1-9? According to Gen 10:10 Babel was a city along with Erech, Accad, and Calneh in the land of Shinar. Shinar had its own king: Amraphel (Gen 14:1, 9). Genesis chapters 1-11 are known as primeval history. God is dealing with the world as a whole. The patriarchal history begins in Gen 12, which God then focuses on choosing a people for himself through one man, Abram (Abraham), who was caught up in pagan polytheism in this area of Mesopotamia. Sin was the only thing that the people of this world were united at this time. They were an idolatrous people and wanted to make a name for themselves by constructing monuments. The Lord diverted these sinful intentions of man by leaving them in their sins and confusing their languages. Different languages and belief make it hard for rebel sinners to agree with each other and work together. Genesis 11:1-9 marks a significant pivot in human history. The event at Babel is the culmination of the human race at this point in primeval history. This history now comes to an abrupt end, as the human race is hopelessly scattered across the face of the earth. The primeval age ends in judgment. This is exactly how our present human age is going to end with the return of Jesus Christ. The people were scattered in Gen 11:1-9. At the end of this age the people will be gathered; Christ will separate the sheep from the goats (Matthew 25:31-33). An honest examiner of Scripture has to compare the historical narrative in Gen 10 with the non-historical remake or duplicate as given to the Mormons in their Book of Mormon in Ether chapter 1. There is no “Jared and his brother” anywhere mentioned in the Pentateuch or the rest of the Bible. Ether 1:43 supposedly being addressed to Jared reads much like what God said to Abram instead. I don’t’ blame Tjay for not believing in the BofM Babel account. I don’t either: religious fiction. Oh yea I am aware of the latest findings. I’m glad you brought it up. It just came out this morning that Thomas Monson took Joseph Smith’s magic rock out of the safe at LDS headquarters in Salt Lake City and flew by private jet to upstate New York. Prophet Monson went to the Hill Cumorah (did I spell that right?) and looked into the ground with the magic rock. HE SAW THE GOLDEN PLATES! Joseph Smith and Brigham Young then appeared to him and each gave a testimony of the BoM. They also told Prophet Monson that sometime in the near future the plates would be excavated and taken to Salt Lake City by relay handcarts and displayed there at LDS HQ. Joseph Smith also declared, in this appearance, that the Book Of Zelph and the Voree Plates should be considered modern day revelation. I’m linking to both. Thanks for bringing this up fred. I almost forgot about it in my haste to get to my yard work. BTW, I found a really cool rock the other day. Sorry, that first link misfired. Here’s a way to get to “The Book Of Zelph”, another testimony of the BoM. This new research is very compelling and makes a person want to follow these prophets. The restoration is so exciting because it is on-going and extremely progressive in nature. New prophets are arising every day with more and more information. The Bible is so old and it just stifles creativity. Insisting that the Bible is God’s final word on who He is and what the plan of salvation entails, just limits all other possibilities. Thankfully we have modern prophets that can change the Word of God providing a new message. Here’s a guy that should also be taken seriously since he was a very dedicated researcher into the BoM archeology. There never was a Mormon as intent on finding archeological evidence as Thomas Stuart Ferguson. After spending years searching, he came to some very interesting conclusions. falcon you kill me LOL! Thanks for the info though. There is so much crazy Mormon stuff out there! How about the new “prophet” in England? Matthew Gill is his name and here’s a cool link to his religion, The Latter Day Church Of Christ, which by the way, came about just the same way Joseph Smith’s did! It even has the name of Christ in it so does that make it Christ’s church? Fred is right, there are new Mormon findings all the time! I wonder if the Smithsonian will be looking at the Book of Jeraneck anytime soon??? Fred, you really need to get a life and find something better to do. You claim Sharon is wrong and does not have all the facts, yet you provide nothing, and a whole lot of nothing. Where is the evidence? where are you getting your ideas from? The same place JS did? You can say and believe what you want, But I am not going to waste my time chasing your fairy tales, you must back up what you say, you cannot just make up stories then expect others to try and figure out what your saying and look for the facts to back you up. The burden of proof is upon you. Bunch of dummies that’s what these modern day prophets are. What can we say about the people who follow them? The problem with the “followers” is that they check their independent thinking some where and just give themselves over to these connivers. The Bible is replete with warnings about this and how important it is to maintain a standard of sound doctrine. There’s something about claims of the supernatural that strips some people of any sense of discernment and even common sense. There are predictable patterns of behavior of these charletons but people still get taken in. In Mormonism for example, there’s so much lying that it’s a normal pattern of behavior and expectation among the faithful and leaders. Those of us on the outside can spot it immediately because our frame of references isn’t crooked. Very funny and extremely telling into your desires for the truth. What I posted is as truthful as anything you’ll find in Mormonism. This post isn’t about the “latest evidence” or “Sharon’s small number of facts”. It’s not about the ACCURACY of the Smithsonian Institute’s position on the BoM-thus “latest evidence” is not pertinent to the topic of the post. This post is also not about some type of grand view of “the facts” and some big conclusion, about the Smithsonian’s accuracy or even the BoM. Rather, if you (and preferably others) read carefully, this post is simply about Mr. Starling making a claim about the Smithsonian’s letter and position. Sharon INDEPENDENTLY confirmed the “small fact” of the Smithsonian’s actual position. The two did not match. Now Sharon is assuming that Mr. Starling is capable of finding out the Smithsonian’s actual position, just as she did. Given such it would seem that Mr. Starling would rather make a claim that is nicer to the BoM then check those facts. This is either laziness, dishonest opportunism, or lying. That’s the topic of this post. For those of you just reading, I wanted to make sure you weren’t sidetracked. To those posting, shame on you for your own dishonest treatment of this post. If you are going to post, then post about the topic. I don’t know to whom you are referring but when Mormons like fred make claims regarding “new evidence” it’s hard to ignore it. I know we’d all be better off ignoring fred but I’m often thinking of the Mormon lurkers who have begun questioning Mormonism. My guess is that some, many, all of those Mormons who have now entered the contemplative stage regarding their commitment to Mormonism and are reading here, have also lived in that trite Mormon speak world of the clydes and freds. So that’s why many of us respond to the clydes and freds when we’d probably be better off extinguishing their behavior by ignoring them. Yes, the topic of Sharon’s post is to draw attention to the habit Mormon leaders or those thought to be prominent, of not just shading the truth, but totally misrepresenting facts and events. The other half of this, is the willingness of rank-and-file Mormons to accept any explanation offered by these leaders. It goes beyond a simple desire to support what they want to believe in. Deceit is the foundation of Mormonism. If a person lives in that crooked world, it becomes normal. That’s why fred keeps repeating endlessly that we need to find the truth. He doesn’t understand that we don’t live in the deceitful world of Mormonism and can actually discern truth from Mormon fiction. Thank you, Spartacus. I really appreciate your reminder of what this post is about. Which is not at all what I got out of it. Probably not what you got out of it either. It’s definately not what fred got out of it. We all have different personalities and differences of opinion, which is what I love about this blog. I totally agree with your response. I simply think that the original topic should be actually discussed before meandering, or actually, meandering first is fine (just more difficult to follow) as long as the topic actually gets discussed at some point. I thought TJayT’s comment was a good one-though also a bit of a sidetrack as none of the post had anything to do with secular corroboration – simply the report by Mr. Starling about the Smithsonians’ position. That’s why I did not quote him as an example of getting off course. I was simply showing how fproy was completely ignoring the post by going into the accuracy of the Smthsonian’s research and some grand disqualification of Sharon’s simple point by trying to say she said something she never did. So fproy was completely off the mark, which has been his general habit. Though I have seen some improvement from fproy’s most recent replies. TJayT may be going into a different area but it has something to do with the “fleshing out” of this topic. fproy seems to be completely negating and attempting to shut down this entire post by questioning the opinion of the Smith and surely planning on getting us bogged down in whether the Smith is right or wrong. I’m sure MC has a post about this somewhere, he can go there. Questioning the entire category doesn’t allow for discussion of anything – something I have great issue with someone who makes it look like they want to discuss other’s issues by participating in a blog that s/he does not get to make original posts on. In the end I am all for full and fruitful discussion, which requires meandering and all unique views. But if all we do is discuss everything but the topic then we risk not talking about anything. Refereeing is all about this, not only “letting them play” but ensuring that an actual game occurs. That’s all I’m trying to do – specifically in regards fproy. And to keep on topic and reiterate what I told Kate, I’ll agree with you that Mr. Starling’s comment that the Smithsonian “admits what they just don’t know” is off to say the least. If he’s trying to make the case that the Smithsonian is now agnostic about the BoM being a historical document then he either doesn’t know what he’s talking about or is lying.